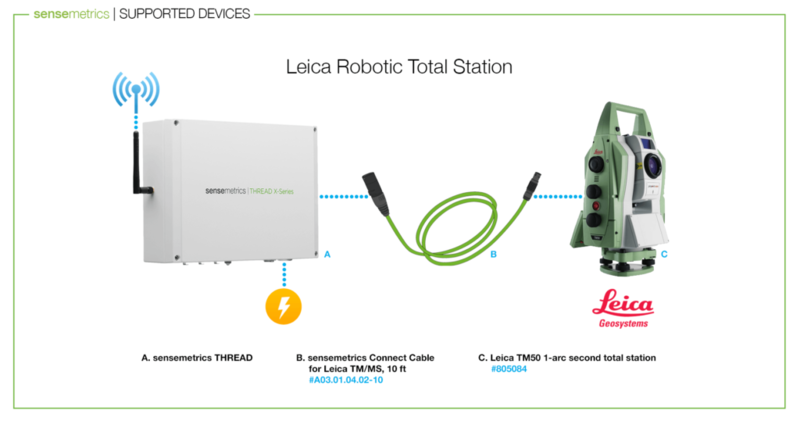 sensemetrics is pleased to announce support for a new device with our platform, the Leica TM/TS series of robotic total stations. The THREAD provides plug & play setup and immediate cloud connectivity, for new installs and upgrade of legacy systems. Unique features include integrated high-capacity lithium-ion battery, direct connect solar panel power input, and DC voltage boost to provide reliable power that meets the requirements of the instrument without expensive external power systems. Integrated device surge protection also provides the highest level of protection against transient surges available on the market today. Secure cloud-based communication channels are easily defined in Leica GeoMOS software, removing frustration with configuration of complicated static IP addressing over WAN.